Bar-Ilan University, Israel's largest academic community is home to over 17,000 students, offering more than 6,000 courses in the natural, life and social sciences, humanities, law, and Jewish studies that are taught by 1,600 academic faculty members. 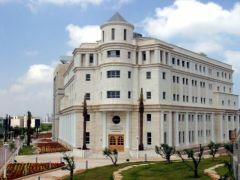 Founded in 1955, Bar-Ilan University teaches tolerance of diversity, pluralism, and multiculturalism in thought and religious belief..
Bar-Ilan University stretches across a modern 130-acre campus in Ramat-Gan. It is located just 10 minutes from Tel Aviv and 35 minutes from Jerusalem.